Detroit Mercy outscored the Youngstown State women's basketball by 10 in the first eight minutes and by 13 in the final eight minutes to defeat the Penguins 80-63 on Friday evening at Calihan Hall. YSU had to battle uphill the entire night, falling behind by as many as 16 in the second period. The Penguins fought back and got within two early in the fourth period before Detroit pulled away. Alison Smolinski had another standout shooting night with six 3-pointers and a team-high 20 points. She was the only Penguin to score in double figures. Jenna Hirsch and Indiya Benjamin both had nine points, and Melinda Trimmer came off the bench to contribute eight points. Rosanna Reynolds led all players with 24 points and 11 rebounds, and Brianne Cohen scored 18 for the Titans. 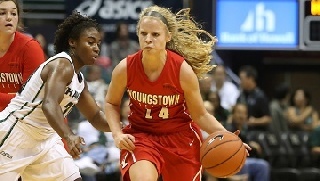 Cohen scored the game's first six points, and the closest Youngstown State would get would be 13-12 with 4:18 left when Smolinski made her second of three triples in the opening quarter. The Titans hit four straight 3-pointers to go up 22-12, and they led 28-19 at the end of the period. Seven of Detroit's points came following offensive rebounds. The Titans extended their lead to 38-22 as they scored 10 of the first 13 points of the second period. Youngstown State scored the next eight points, with four of them coming from Trimmer, to cut the lead in half with 4:46 left in the second. Each team scored just two points before heading to the locker room. Youngstown State got within three twice in the third, the second time coming on a Benjamin 3-pointer at the 4:31 mark that made the score 48-45. Detroit went on an 8-2 run to go back up by nine, and YSU trailed 56-49 heading into the final period. YSU scored the first five points of the period to get within 56-54 on another Smolinski 3. Cohen scored the next four points in transition to kickstart an 8-0 run, and the Titans ended up outscoring the Penguins 24-9 the rest of the way. Youngstown State shot just 33.8 percent and went 9-for-30 for 3-point range. Detroit shot 47.1 percent and made 10 3-pointers in 25 attempts. YSU will play at Oakland on Sunday at 3 p.m. The game will be broadcast live on ESPN3 and SportsAnimal 1390 WNIO.